Images taken from the Curiosity rover show a series of sedimentary deposits in an area of the Gale Crater. The universe is feeling a little less lonely these days. Scientists Monday published the strongest evidence yet of an ancient freshwater lake on Mars that could have been home for life as we know it. The lake is dry and there are still no signs of little green men — or even microbes. But that report, based on data from the Curiosity rover and published in the journal Science, comes just a month after a team of scientists analyzing data from the NASA space-based telescope Kepler announced that one in every five stars like the sun is circled by an Earth-like planet. The new findings suggest we may be closer to finding the answer to the question that humans have been wondering about for centuries and that has been a staple of science fiction: Are we alone? More immediately, the insights will help focus future missions to Mars. 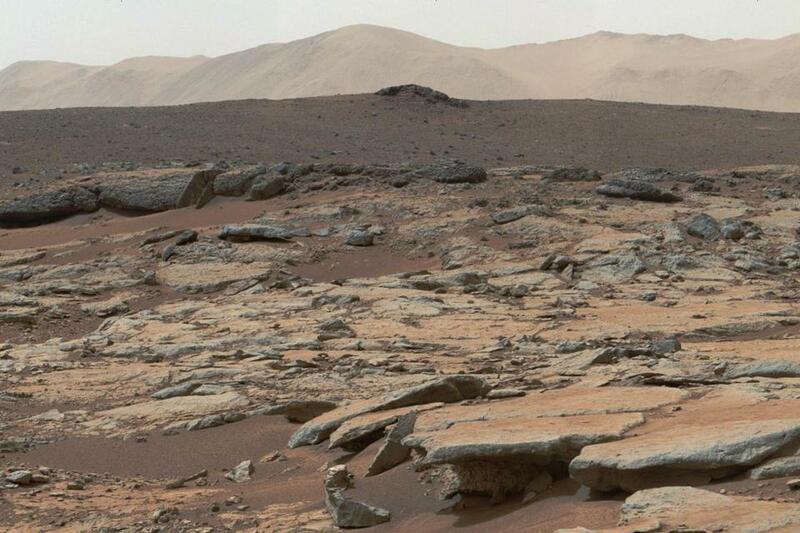 For decades, scientists have known there was water on Mars. Its red surface was once carved into canyons and riverbeds by liquid water, and there is ice in its soil and at its poles. What they haven’t known as much about was what that water was like. An earlier Mars rover, Opportunity, which landed on the planet in 2004, sent back reports of rocks that formed in a “very bizarre, acidic bath-like environment” — harsh conditions in which to imagine life starting, said John Grotzinger, the chief scientist of the Mars Curiosity mission. What the new rover has discovered, as it has drilled, zapped, and baked samples, is something very different — evidence of a freshwater lake that stuck around for hundreds or tens of thousands of years and would have taken up about the same area as the Finger Lakes in New York. Asked what that lake might have looked like when it existed 3.6 billion years ago, Grotzinger said it may be useful to think of the Western United States. After Curiosity landed in Gale Crater in August 2012, scientists decided to take a temporary detour in the opposite direction of its ultimate destination — the 3-mile high Mount Sharp. Before the mission, scientists had spoken mostly about how the rover was going to analyze the mountain layer by layer, reading through the geological history of Mars. But it landed temptingly close to rocks that satellite measurements had indicated might be of interest, so the rover started to explore these rocks in an ancient environment known as Yellowknife Bay, which was clearly shaped by water of some kind. The rover drilled and analyzed two rocks in detail using instruments on the rover. The scientists couldn’t tell directly from those sedimentary rocks whether life existed in the lake. But the makeup of the clay rocks revealed that they had to form in the presence of fresh water, not the acidic conditions detected elsewhere on the planet. There was also evidence of iron and sulfur in chemical states that indicated they could have been used to fuel the metabolism of chemolithoautotrophs, a type of microorganisms found on Earth that feed on chemicals in rocks. Now, Grotzinger said, as the rover turns back toward Mount Sharp, its primary mission — determining whether Mars hosted an environment that would have been habitable — is already complete. The team is turning now to a much more difficult task: finding carbon-based organic molecules, an essential ingredient for life on Earth. That effort has been complicated by the pervasive presence in the soil of a salt called perchlorate, which can react with organic carbon in the soil and make it hard to detect. Roger Summons, an astrobiologist at the Massachusetts Institute of Technology and a participating scientist on the mission, said there is hope for overcoming this problem. One possible way is already used in labs on Earth and is currently in the planning stages on Curiosity, he said. Scientists will have one other powerful new tool in their search for the right rocks to probe on this mission and others: They reported on Monday that they have been able to date a rock on the surface of Mars using instruments on Curiosity. Previously, the primary way scientists could estimate the age of an area was by analyzing the number and size of craters. The older a region, the more it was pocked with craters created by collisions with space debris. But that method provided only a rough approximation of age. Now, the Curiosity team has found a new way to refine its search by identifying areas of the planet that are newly exposed and therefore free from damaging radiation that might have destroyed traces of organic molecules. Mars isn’t the only spot in the galaxy to look. A group of scientists announced in November that Earth-like planets that sit in their star’s habitable zones, where conditions are right for life, are surprisingly common. Based on observations of one portion of the Milky Way by Kepler, astronomers estimated that a fifth of all stars like our sun harbor such a planet, and the nearest one is probably just 12 light-years away. Johnson can be reached at cjohnson@globe.com. Follow her on Twitter @ carolynyjohnson.